The little ringed plover (Charadrius dubius) belongs to the family of lapwings and plovers, the Charadriidae. The little ringed plover species is distributed in Europe, central Asia, Middle East, central Africa, Indian subcontinent and southeast Asia. These plover species have a distinctive bright yellow eye-ring. These plovers are polytypic species. The little ringed plover (Charadrius dubius) is a small plover, measuring 15 to 18 cm in length and weighing 25 to 50 grams. These little plover species have a distinctive black and white head pattern, similar to the common ringed plover. They have sandy-grayish brown back and wings. The underparts are whitish. The black neck band extends to the upper breast. The forehead of the little ringed plover has a black patch and the forecrown is white. There is a brown cap. The black mask ends in an angular shape beyond the ear covert. A white line separates the black mask from the brown crown. Juveniles lack black markings on the head. The bill is short, strong and black. The base of the lower mandible is pinkish. The irises are dark brown. There is a distinctive bright yellow eye-ring. The legs and feet are pale yellow. The call of these plover species is a loud, repeated "piuu..piuu..piuu" sound. The little ringed plovers are distributed in Europe, Asia, Middle East, central Africa, Indian subcontinent and southeast Asia. The little ringed plover nominate subspecies C. d. dubius is a resident breeder and is distributed in Philippines, Papua New Guinea and Bismarck Archipelago (New Britain and Latangai Island). 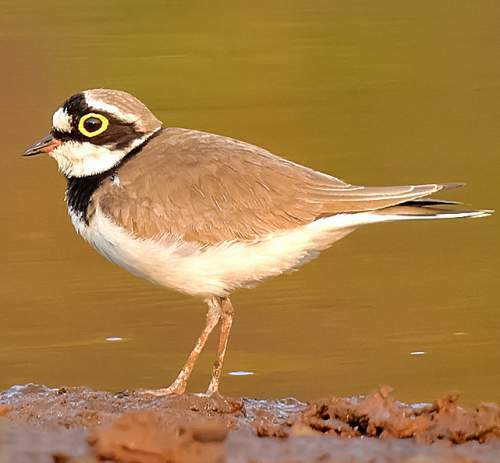 The little ringed plover subspecies C. d. jerdoni is a resident breeder and is distributed in Indian subcontinent, southeast Asia (Myanmar, Thailand, Cambodia, Laos, Vietnam) and southern China bordering Myanmar and Vietnam. The little ringed plover subspecies C. d. curonicus is migratory. The breeding populations are distributed in Europe, Mediterranean region, west Asia, central Asia, Russian Far East, North Korea, South Korea, east China, Japan, north Africa and Canary Islands. The subspecies C. d. curonicus winters in central Africa (south of Sahara), Arabian peninsula, Middle East, east China, Taiwan, Malaysia and Indonesia. The Important Bird and Biodiversity Areas (IBA) of these little ringed plover species in China are, Chongming Dongtan Nature Reserve and Ulungur Hu and Jili Hu. The IBA in France is Estuaires picards : baies de Somme et d'Authie. The IBA of these little ringed plover species in Japan are, Shiokawa tidal flat, Osaka Nanko and Lake Kasumigaura, Ukisima. The IBA in Kazakhstan is Lesser Aral Sea. The IBA in Mongolia is Uvs Lake. The IBA in Philippines is Manila Bay. These little ringed plover species have low forest dependence. They normally occur in altitudes from 0 to 800 meters. The artificial ecosystems and habitats of these species include irrigated lands, pasturelands, rural gardens and urban areas. The natural ecosystems and habitats of these little ringed plover species include tropical and subtropical mangroves, tropical and subtropical flooded grasslands, freshwater lakes, rivers, streams, creeks, estuaries, sand bars and marine shoreline. The diet of this little ringed plover consists mainly of insects. Insects, insect larvae, spiders, ants, grasshoppers, crickets, cicadas, locust, dragonflies, beetles, worms, crustaceans and snails are their primary food. These plover species pick their prey from the ground as well as from the shallow waters. They have been found to occasionally feed on vegetative matter like grass seeds and sedges. The breeding season of these little ringed plovers is from April to June in Europe. The laying season is from March to May in north Africa. The subspecies C. d. jerdoni breeds from March to May in India and during June and July in southeast Asia. These little ringed plover species are monogamous. The breeding sites include bare or sparsely vegetated sandy and pebbly shores of lakes, pools and slow flowing rivers. The nest is a shallow scrape on the dry ground, loose sand or dry mud. The typical little ringed plover clutch contains four whitish eggs with dark spots. Both the parents incubate the eggs. The chick hatch out by 25 days and fledge after 25 days. These little ringed plover species are mostly migratory birds. The populations in Europe and northern Africa migrate during June and July and reach tropical Africa for wintering. The return migration to the breeding grounds occurs during March and April. The little ringed plover populations in central Asia migrate to southeast Asia and parts of India for wintering. The subspecies C. d. jerdoni and C. d. dubius are non-migratory resident breeders. The global population size of the little ringed plover (Charadrius dubius) is estimated to be about 280,000 to 530,000 individual birds. The overall population trend of the species is considered to be stable. In most of its range, this plover species is reported to be common and locally scarce. The generation length is 5 years. Its distribution size is about 87,600,000 sq.km. 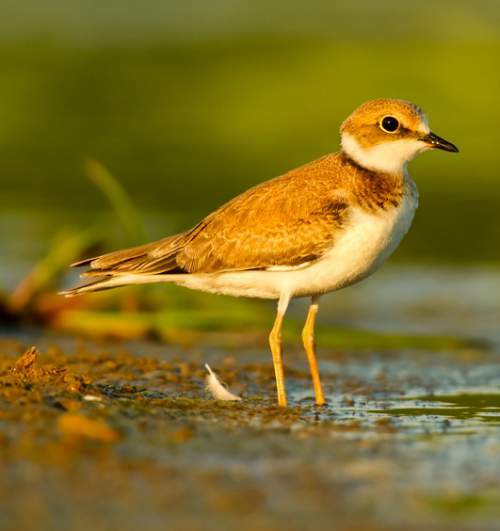 Habitat alteration and destruction, pollution, human intrusions and disturbance, hunting for food, trapping for pet-trade and outbreaks of avian botulism are the main threats that are endangering the survival of these plover species. The little ringed plover (Charadrius dubius) does not approach the thresholds for being Vulnerable, either under the range size criterion, or under the population trend criterion or under the population size criterion. The IUCN (International Union for Conservation of Nature) has categorized and evaluated the little plover species and has listed it as of "Least Concern". The CITES (Convention on International Trade in Endangered Species of Wild Fauna and Flora) status is ‘Not Evaluated’ for the little ringed plover (Charadrius dubius). The little ringed plover (Charadrius dubius) is closely related to long-billed plover (Charadrius placidus), semipalmated plover (Charadrius semipalmatus) and common ringed plover (Charadrius hiaticula). The three recognized subspecies of the little ringed plover (Charadrius dubius) are: Charadrius dubius dubius Scopoli, 1786, Charadrius dubius curonicus J. F. Gmelin, 1789 and Charadrius dubius jerdoni (Legge, 1880). 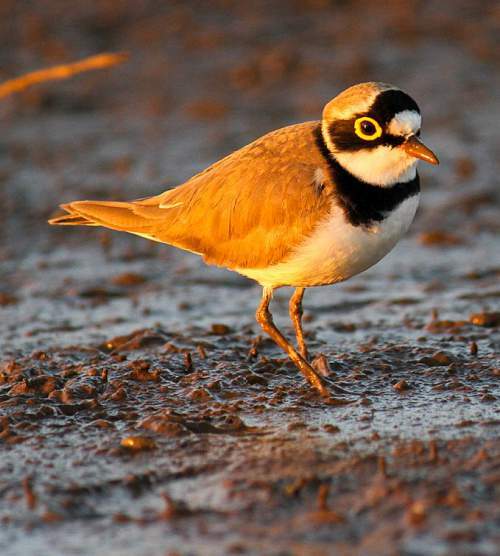 Current topic in Birds of India: Little ringed plover - Charadrius dubius.